Bonnie did her first open mic in Vancouver, Canada. The manager of the club told her she should enter a contest, The Search for Canada’s Funniest New Comic. She did and she won. She moved to New York where she landed a manager, an agent and taped her first half hour special which still airs on Comedy Central. Bonnie got a deal with CBS to star in her own sitcom. That sitcom never happened, but after her deal was over she landed a starring role in another sitcom on UPN called Social Studies. After six episodes, the show was cancelled but another show was just around the corner. Christopher Guest wrote Bonnie a regular role in his pilot for HBO called D.O.A. The show was D.O.A. HBO never picked it up. Bonnie continued doing stand up in Los Angeles and appeared on The Late, Late Show with Craig Kilborn, Friday Night, Premium Blend, hosted Later on NBC and was a regular on Tough Crowd with Colin Quinn. She also landed roles in several other pilots and television shows including Gross Pointe, Scare Tactics and The Drew Carey Show. Not content with just being a performer, Bonnie began writing and doing punch up for various television shows including The Man Show, Spy TV and Trigger Happy. 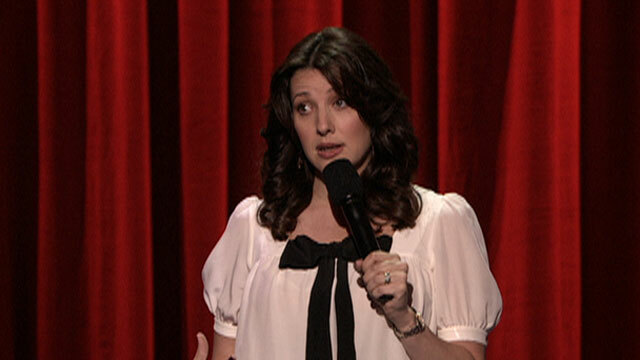 Bonnie went on to participate in the second season of NBC’s Last Comic Standing and became one of the shows stand out characters, which led to an appearance on The Tonight Show with Jay Leno. She became a regular on The Late Show with David Letterman and started headlining shows across the country. Most recently Bonnie taped her first HBO hour special, which is currently airing. Bonnie continues to pursue stand up, writing and acting and has created several multi media stage shows like The Fake, Fake Show starring Zach Galifinakis and a short film starring Patton Oswald called Sushi Whore.